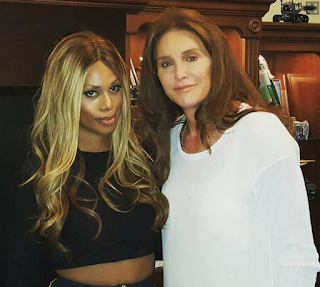 Trans girls Caitlyn Jenner and Lavern Cox meet for the first time. Caitlyn Jenner and Laverne Cox finally got the chance to meet. Cox, who has shown her strong public support for Jenner and her transition from Bruce to Cailtyn, took to Instagram late Sunday to document their friendly interaction. "@caitlynjenner and I finally met in person at a special private advance screening of #IAmCait.#TransIsBeautiful #girlslikeus#caitlynjenner," she captioned a photo of the pals. The "Orange is the New Black" actress also shared a shot of her and Jenner with a group of ladies who also got the first look at the former Olympian's upcoming docu-series "I Am Cait." "Fun with #girlslikeus tonight at the screening of #IAmCait@tracelysette @candiscayne@smartassjen @zackarydrucker#MimiMarks #TransIsBeautiful," she wrote.